Yaki (grill) tori (chicken): Negi (onion) ma (?) 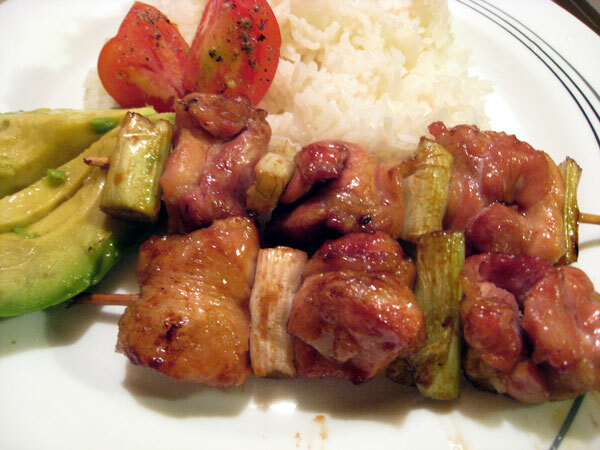 This is a popular yakitori dish for good reason! It’s not difficult to make and it is delicious. • a metal bread pan is good for heating the yakitori sauce on the grill, and it’s easier to dip the chicken into the sauce than to baste the chicken. Just dip and shake! 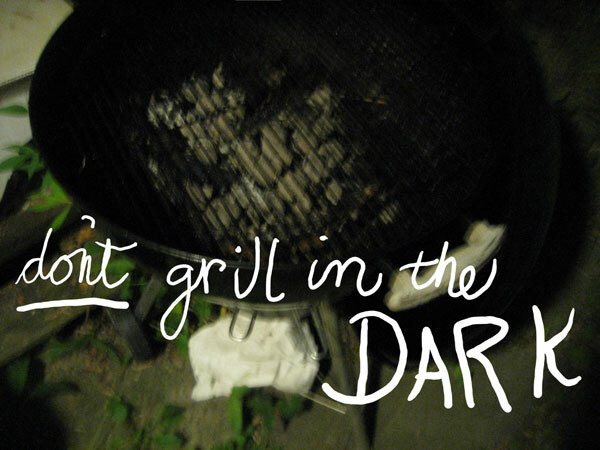 • don’t grill in the dark. Being tired and hungry does not make a happy cook. and I had a lunch with the leftovers, but 4 people would have been hungry. • Cut the chicken into small pieces, about 1″ by 1 1/4.” Cut the onions into 1 1/4″ lengths. Skewer chicken and onion alternately. Tuck the skin between meat and vegetable so it won’t burn. 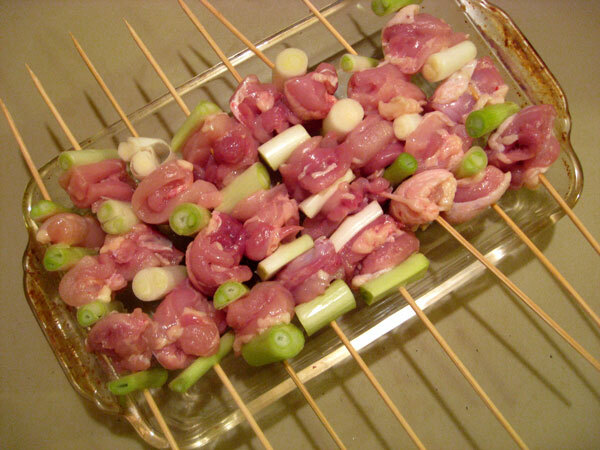 • Heat a grill (you can broil these, also) and cook the skewers for 4 minutes, turning several times. • Serve hot! But they tasted great when I had a cold lunch. So! that’s where those skewers went. Glad you enjoyed them cold. The peanut butter and jelly sandwich I had for lunch wasn’t too bad. Seriously though, the chicken was quite tasty and not overly salty. Another thing good about this recipe is that, since the meat is in small sections, you can be sure it is sufficiently cooked, without having to leave it on the grill for an hour or finish it off in the oven after giving up on the grill. I like your intro photo, though it looks like you’re copying my handwriting, or at least someone’s whose script is less elegant than yours.